By LUDWIG VON KOOPA - Fans like him more than the other forms of plumber. I don't ever write articles complimenting Mario Mario. He's a terrible person. His brother is, too. I write negative stuff about him. Constantly. His creator, too. Of Pixel Mario, Cat Mario, Baby Mario, and Paper Mario, which big-nosed diabolical jerk did fans want to meet the most? 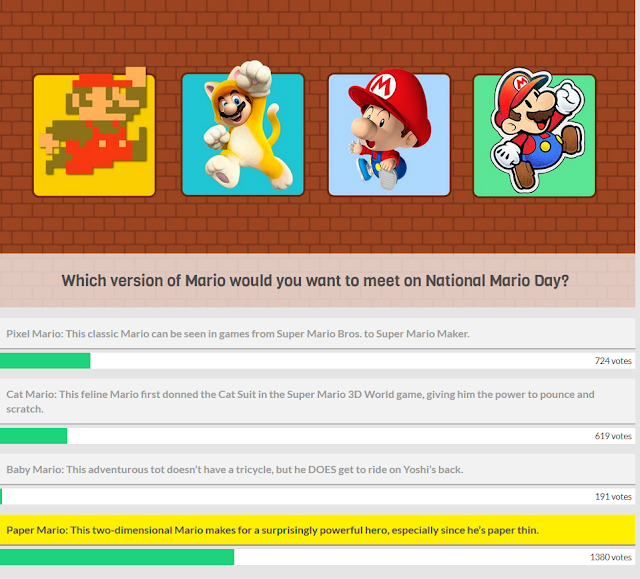 Paper Mario won by a large plurality! What's so scary about honesty? Votes not actually mattering aside (and they don't seem to in American politics, either), let's talk about the actual content. 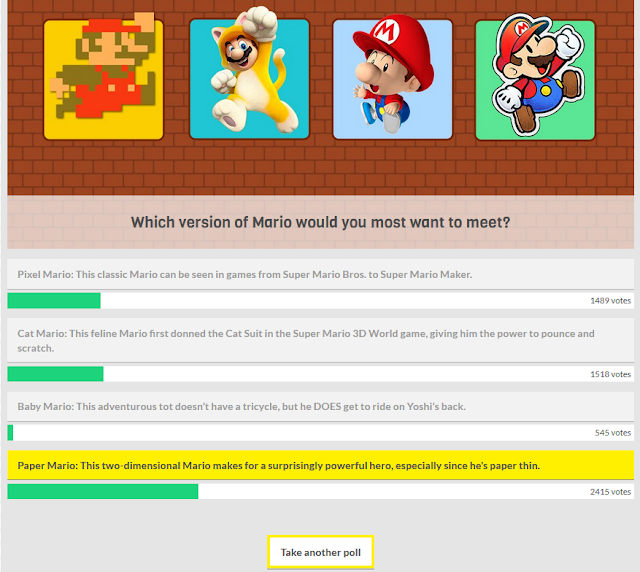 Obviously, most people wouldn't want to meet or visit Baby Mario. Especially for free. Babysitters do demand financial compensation, after all. But you'd think Pixel Mario would be very popular given Super Mario Maker's sales, and a bunch of people being suckers for nostalgia. And there are tons of furries out there who love Cat Mario. Team Costume Party got NEARLY 50% of the vote! But all of the furries and nostalgic losers in the world (...well, there's only like 3,000 of them in the poll and there's several million more out there, so SOME of the furries and nostalgic losers) couldn't stop the sheer plurality of Paper Mario! Keep in mind that these polls were run AFTER Paper Mario: Color Splash was announced in all of its awfulness, though also after Mario & Luigi: Paper Jam which I...THINK was well-received. I liked it. It wasn't as bad as its sub-title made me believe it would be. I think the intended message is clear, similar to how Mega Man got so far and managed to beat Charizard back in GameFAQs's 2013 contest. Mega Man was left in the junkyard by CAPCOM, and voters felt really bad for him and voted for him past a bunch of Pokémon. While Paper Mario is still making appearances, those appearances sure are not good for his image. Paper Mario fans don't fall into the same kind of nostalgia trap as Pixel Mario voters do. Pixel Mario appearances now are just for nostalgia. Paper Mario is absolutely a viable franchise for non-nostalgia reasons. Wanting a Japanese RPG with story and characters is not some nostalgia-driven dream: It's a very normal thing in the gaming industry, and it used to be why the Paper Mario series existed. I'm not really sure why the Paper Mario series still exists today, but so many people, KoopaTV staffers included, want it to return to form with the clear sense of purpose that it had before. And in that purest form, it is the superior sub-series in the Mario franchise. Better than any other Mario gaming experience. It also helps that he comes from a series that traditionally cares about characters, and the poll was about characters. Ludwig has a paper version of himself out there. He can't wait for everyone to meet him, but it can only happen if Paper Mario is made great again! You should Follow Ludwig at NNID PrinceOfKoopas on Miiverse, because he has nowhere else to go. For a detailed explanation of what went wrong with Paper Mario: Sticker Star, and Shigeru Miyamoto's role in it, click here. Ludwig seems to have something against nostalgia, and claims not to have much of it. Fun fact: KoopaTV's first March 10, in 2014, was about Ludwig being in Mario Kart 8. KoopaTV's second March 10, in 2015, showed Ludwig exposing Mario's racist cow operation in Mario Kart 8. And KoopaTV's third March 10, in 2016, had Ludwig making fun of Mario Kart TV being shut down. It was used for Mario Kart 8. There's a trend here. KoopaTV reverses its bashing of Paper Mario: Color Splash after E3. The article's title makes reference to Mario being a plumber. Some are now trying to say that Mario isn't a plumber. We say he is. If Paper Mario: Color Splash is Sticker Star 2.0, then I do not know if the series will ever be great again. Only time will tell from here. If Color Splash is Sticker Star 2.0 then the series probably shouldn't get another game again. I'm still hoping they've taken the Color Splash reactions to heart and have revamped it to include a plot and characters, if it lacked these things before. People are trying to spread rumours that they actually did totally rework Color Splash and that's a major factor in why E3 will be the way it is. I WANT TO BELIEVE IT! But... Does Intelligent Systems even know how to make a game like that anymore?